The inherent cleanliness of natural gas when compared with those other fuels, coupled with the high efficiency of natural gas equipment, means that substituting gas for the other fuels can help reduce the emission of the air pollutants that produce smog and acid rain and that could exacerbate the "greenhouse" effect. The natural gas system is extremely efficient as are most types of appliances and equipment that operate on natural gas. Energy efficiency refers to the energy input per unit of useful energy output. In other words, energy efficiency measures how much energy is used or lost in providing such things as hot water, steam, warm or cool air. The higher the energy efficiency, the greater the conservation of energy and the lower the environmental impacts. 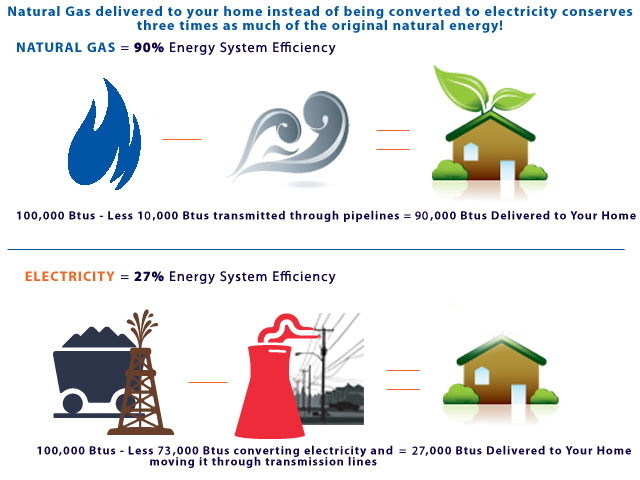 When the entire cycle of producing, processing, transporting and using energy is considered, natural gas is delivered to the consumer with a "total energy efficiency" of about 90%, compared with about 27% for electricity. Moreover, gas appliances and equipment are extremely efficient as evidenced by the fact that the residential use of gas per customer is about 16% less today than it was in 1980. Natural gas is a highly reliable North American energy source. Approximately 85% of the natural gas consumed in the United States is produced domestically from the nation's extensive gas resource base. Nearly all of the remaining 15% is produced in North America, primarily in Canada. In comparison, close to 60% of the oil used in the United States is imported from foreign countries, some of which are politically unstable. Furthermore, natural gas is a reliable source of fuel not only because most of the supply is domestic, but also because the pipeline delivery system is underground and protected from weather-related disruptions. This reliability is one of the reasons businesses that cannot afford power disruptions find gas-fired distributed electricity generation so attractive. For instance, McDonald's and other food chains are testing gas-based distributed generation because they cannot afford power outages that could destroy their food products. Natural gas technologies can contribute to the United States' foreign trade offerings. An expanding domestic natural gas industry offers worldwide trade opportunities. The United States leads the world in terms of its natural gas infrastructure, and U.S. companies are furnishing equipment and expertise to countries in Central America, South America, Europe and the Far East that are just beginning to develop natural gas systems. In addition, a strong global market exists for gas-related products such as high-efficiency gas turbines. The domestic natural gas industry employs hundreds of thousands of workers and helps fuel the economy. Besides providing one of the fuels that drive economic activity, the U.S. natural gas utility industry employs about 150,000 people. Roughly the same numbers of people currently work for oil and gas exploration and production companies. Gas utilities have strong ties to the communities they serve, purchasing goods and services in addition to providing jobs. According to the Department of Commerce's Bureau of Economic Analysis, every $1 million of revenue generated by gas utilities increases national economic output by $2.66 million, employee earnings by $450,000 and employment by 14 workers. What gives? Well, in the last several years two things have happened. First, there have been massive natural gas strikes in Louisiana, Texas, Arkansas, Michigan, Pennsylvania and elsewhere. The United States is now estimated to have more than 100 years supply at current rates of consumption. (And it may be much more than that.) Second, tapping that gas is now much easier, thanks to a new process known as hydro-fracking, which pumps high pressure water (and other chemicals) into the rock, freeing the gas. It also doesn’t hurt that natural gas is far and away the cleanest burning fossil fuel, more than 50 percent cleaner than coal. Natural gas has another huge advantage. When you start up a coal fired power plant, it takes a full day to bring it up to temperature (to avoid damaging the boilers), and it has to burn 24 hours a day. A typical coal fired boiler produces anywhere from a few hundred MW to over 1,000 MW. Natural gas in a combustion gas turbine can produce 100-300 MW, takes up minimal space in comparison, and can be up and running in less than 30 minutes. They are often used for peak load. The heat from the exhaust of multiple units can be used to make steam, and so achieve greater efficiency through co-generation. The advantage of being able to start up your power generators in the morning and turning them off in the evening, burning no fuel for 8-10 hours a day, is enormous. With natural gas, you'll never run out of fuel. Underground pipelines mean there is no disruption of supply due to storms or power outages. Unlike other heat sources that leave ashes and odors, natural gas will never leave a mess. And you'll love the convenience natural gas adds to your home - from instant, cozy heat, to precision cooking, and nice, long showers without running out of hot water. Natural gas can save you money. Visit the appliance section to view cost comparison. Natural Gas is still your best energy buy. Natural gas is one of the world's safest sources of energy used by over 15 million Canadians to heat their homes and businesses. 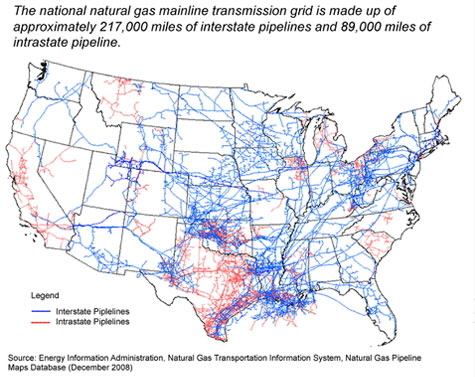 Natural gas comes from a pipeline underground. It's always there when you need it and you never have to worry about running out of fuel, or arranging for deliveries. Many natural gas appliances will operate during a power outage so you can still stay warm, have hot water and eat well. Once your home is connected to natural gas, it's easy to convert appliances or add additional gas products later on: outside for your barbecue, pool heater, and gas lights - in the basement for your water heater and clothes dryer - in the kitchen for y our range and/or cooktop - in the den and living room for your natural gas fireplace - compressed natural gas are being in many part of the world with new models coming to the United States from Honda and others. Natural gas can be used in all classes of vehicles - motorcycles, cars, vans, trucks, buses, lift trucks, locomotives, even ships and ferries. 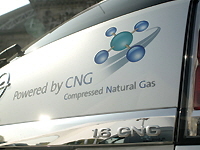 NGVs are available from many manufacturers including e.g. Opel, Fiat, Mercedes, Ford, Volkswagen, Citroen and Iveco. International supply issues will never stand in the way of heating your home. There is a secure supply of natural gas in Canada. Clean burning natural gas heating equipment means less maintenance and repairs over the years. Adding natural gas heating, a fireplace and other appliances to your home, farm or cottage will pay dividends down the road when you decide it's time to move. What Can You Do To Promote More Domestic Use? America needs a comprehensive energy policy that includes energy from all sources. However, a pattern seems to be emerging when it comes to developing Americas offshore oil and natural gas resources—delay. Now, more than ever, we cannot afford to delay. Contact your Congressman and urge him or her to consider additional legislation to increase use of natural gas as the best viable energy for America’s future.